We visited Sydney on the weekend – the main reason was to see my son and his partner – but secondly to enjoy the diversity of restaurants and cafes that Sydneysiders get to experience firsthand. There is such an array of eateries for locals in Sydney, one is quite hard-pressed to decide where to go first. My son lives in Waterloo and as we usually enjoy self-catering accommodation in the Zetland area, I’m quite happy to experience what this area has to offer locals and tourists alike. And, this is how we came across the Freedom Hub Cafe. I love the ethos of places like the trendy Freedom Hub Cafe – they are a registered charity with a mission to rehabilitate and empower victims of human trafficking and slavery-like practices within Australia. One hundred percent of the Cafe profits support survivors of slavery within Australian borders. I must add here that I wasn’t aware of this practice within the borders of Australia, but still admire the whole concept of what Freedom Hub Cafe aims to achieve. Freedom Hub Cafe has a Survivor School, which runs twelve classes a week to help survivors regain confidence and become work ready. The Cafe is a ‘business for purpose’ as it was built with the sole purpose to provide profit to sustain the Survivor School. It’s a place where survivors are given one-on-one mentoring to restore their hope, confidence and self worth. Situated within an industrial area, one could quite conceivably miss this little gem in Waterloo. Stunning contemporary decor manages to uplift the whole warehouse aspect of the Freedom Hub Cafe, allowing visitors to sit back and enjoy the ambience of a very peaceful creative space. The morning that we visited – it was brunch time – a ‘schooling’ session was in progress, but rather than be intrusive on guests to the Cafe, only served to add a compassionate human interest factor. Freedom Hub Cafe serves premium coffees using the finest, organic and ethically produced coffee beans, which are roasted in Australia. They have a range of Exotic Teas which are ethically sourced, handpicked and created to lure the senses and calm the mind. The Menu is creatively fresh, with healthy food choices, inspired by a diversity of cultures. 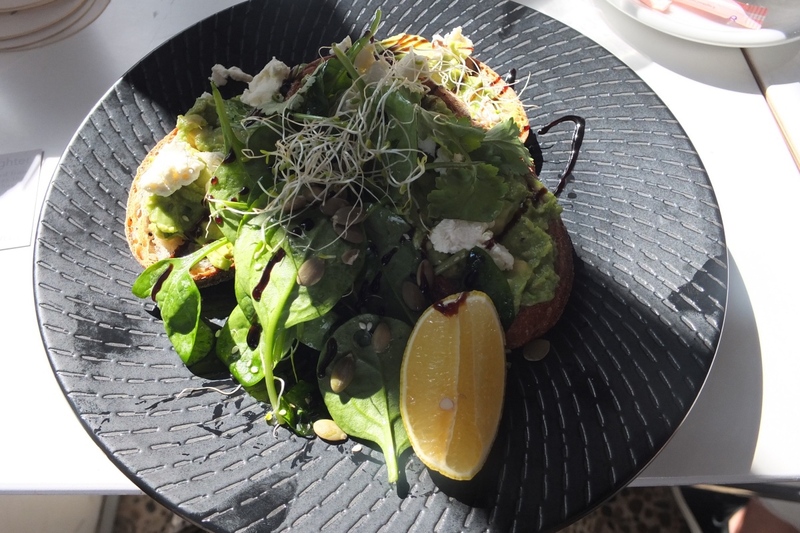 My ‘brunch’ of choice was the Avocado, Sourdough and Creme Goats Cheese topped with fresh lemon juice, a drizzle of extra virgin oil and cracked pepper for $14. It was beautifully served and a taste sensation second to none. The coffee is called Freedom Fighter coffee and the profits are used to support orphanages that rescue child soldiers overseas as well as survivors in Australia, and was that delicious, we all had seconds. The service at Freedom Hub Cafe was super efficient, the staff were friendly and eager to please, and the food was definitely worthy of a ‘return visit is a must’ accolade. I was allowed to roam around and take random photos and was impressed with the areas which are available to be be used for special events like weddings or birthdays. The venue at Freedom Hub Cafe can be booked for events on Mondays to Fridays from 2.00pm till late or on Saturdays from 11.00am till late. The bathrooms were immaculate (very important to me) with the signage ‘Never let anyone dull your sparkle’, which I thought was very in-keeping with the Freedom Hub Cafe’s philosophy. In addition, they have a variety of Freedom gifts, all adding to the fun of eating out and doing a bit of shopping on the side. A small section with an Indian tent (tepee) has been set aside specifically for children – so definitely a child-friendly venue too. The Freedom Hub Cafe is an urban escape where you can enjoy freedom from daily pressures, be immersed in other cultures whilst sipping a speciality coffee or exotic tea.